Don Sweete was born in Bowmanville , Ontario, Canada and now resides in Oxford County, Ontario, Canada. After graduating from the University of Western Ontario, where he studied Trombone as well as Composition, he performed extensively, as both a free-lance musician and a regular player, with many ensembles including the Victoria Symphony Orchestra, the National Ballet, the Canadian Opera Company, the Canadian Broadcasting Corporation, the Hamilton Philharmonic, the Mainly Mozart Orchestra, Orchestra London Canada, Ice Capades, the Royal Alexandra Theatre, as well as a wide variety of chamber groups, theatres and shows. For the past thirty years he has been a member of the orchestra, as well as actively involved in music preparation, at the Stratford Shakespeare Festival (Canada). His compositions and arrangements have been widely performed. “I have always been fascinated by mirrors. When I was a young boy, I used to imagine that there was a unique and separate world on the other side of every mirror, a sort-of parallel universe to our own. Imagine what people in that world must think of us, since the only time we stop by is to admire ourselves! 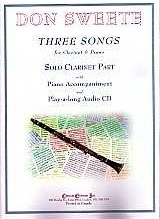 These mirror-thoughts have taken me, often, to the fable of Snow White & the Seven Dwarfs and from thence to these THREE SONGS for Clarinet & Piano. “The Grumpy Man” - 7/8, 5/8, 6/8 (quarter = 126/eighth = 252).